If you need to carry big-sized goods in an open space but pickup trucks are not the right fit, then tray trucks can be your best choice. Tray trucks offer a wide tray at the back which enables you to store big and tall things in a bigger amount than pickup trucks. 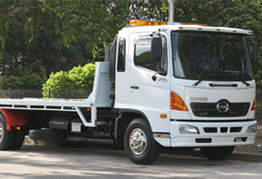 Our tray trucks are built in good materials and we provide professional services for your projects.